We have a lot of tomatoes growing in random places at our house thanks to our dogs going to the bathroom all over the place after eating out of our compost pile. Notice the tomato plant in the middle of the flower beds. 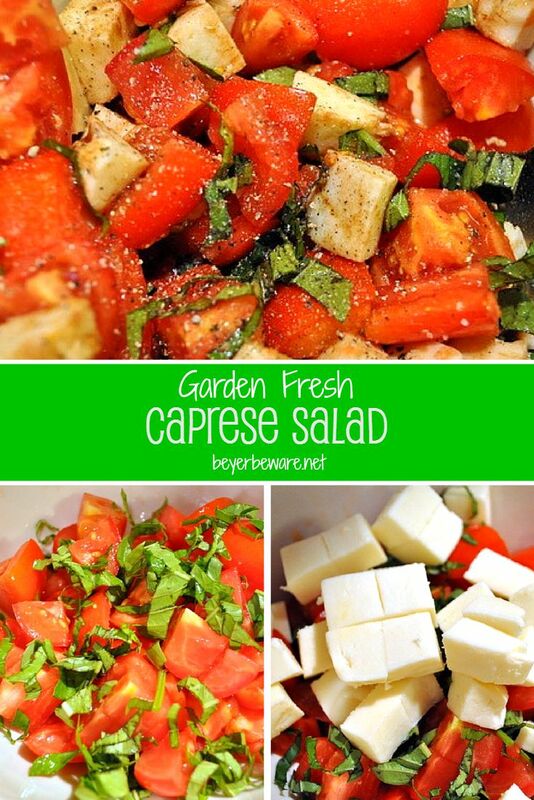 Which is why we live on Caprese salad also know as our fresh tomato, mozzarella, and basil salad. I think the tomatoes are roma, but their has been some unique crossbreeding going on because they are not a true roma. Regardless, they are plentiful and good! We have been eating salsa and tomatoes on burgers and my ultimate favorite, tomatoes and fresh mozzarella with basil a lot this summer. This is another one of those, a little of this and a little of that recipes. Start with cutting up the tomatoes in bite size pieces. And get ready to cut up some basil. I planted two basil plants in the back flower beds. I just go pluck several leaves whenever I am ready to use them. By the way, most herbs are organic because they keep pests away naturally with their strong smells. So, if you don’t grow your own herbs and can only find organic and are a bit anti-organic like I am due to the higher prices, know it is a marketing ploy in most cases. Herbs grow organically without the need for pesticides to keep bugs from eating them away since they smell so strongly. I ribbon the basil. I roll the pile up width wise and slice it down the length. It make a pretty little dish with little to now work. I try to have fresh mozzarella balls of cheese in the fridge at all times. Luckily, right now Aldi’s sells them. This one came from the fresh cheese case in Kroger (by the deli meats.) I used half of the ball. I then cubed the cheese into bite sizes. I just toss it on top of the tomatoes and basil. I then grab a bottle of my balsamic vinegar and dose the bowl. I would guess a tablespoon or two. Use your judgment. Before the final stir, add salt and pepper to taste. I like lots of flavors.Can you tell I like a lot of seasoning? It is simply the best summer salad! Fresh tomatoes out of the garden with fresh basil and mozzarella make the simplest and easiest Caprese salad recipe. Mix tomatoes, cheese, and basil together. Add balsamic vinegar one tablespoon at a time. Stir into tomato mixture. If more is not needed to coat everything, don't add it. Season with salt and pepper. Refrigerate till ready to serve. YUM! That looks really really good! Wish my tomatoes would have done better this year. Thank goodness for grocery stores! Oh yeah, can't go wrong with those ingredients…one of our summertime favorites. Yum! I can't wait for some fresh tomatoes this summer!